Melancholia; a condition characterized by severe depression as manifested by loss of pleasure in all activities; including early morning awakening, marked agitation or retardation, severe anorexia with weight loss, and excessive or inappropriate guilt feelings. 1. A rarely used term denoting foolishness or dullness of comprehension. 2. Dullness of mind; mental lethargy. 3. Another rarely used term for a mental state marked by frivolity, joviality, an inveterate tendency to jest, and inability to take anything seriously. 4. An abnormal tendency to joke, particularly inappropriately. 1. A term for a mentally deficient person whose mental age is equivalent to that of someone between eight and twelve years of age; subnormal intelligence; in England, called, a dullard. 2. Informally, a "stupid" person; a dolt. 3. Someone who is considered to be notably stupid or lacking in good judgment. 4. In psychology, a person of borderline intelligence in a former classification of mental retardation, having an intelligence quotient of 50 to 69; feeble-minded. The term belongs to a classification system no longer in use and is now considered offensive. Though a psychological, clinical, and medical term, it is often used as a pejorative term against someone of low intelligence; or even, as just a general pejorative. Most of those who are clinically classified as being morons are considered to be educable and do not require institutionalization but need some supervision in working at some simple job by which they can become "self-sustaining" members of society. 1. Having a mental age of between eight and twelve years. 2. Disapproving; such as: "a moronic grin" or "She made some very monronic suggestions." The term "mental retardation" has often replaced "moronic" and is now used in technical or scientific contexts. In North America, the broad term "developmental delay" has become an increasingly preferred synonym by many parents and caregivers. 1. An adverb describing actions that are considered to be of subnormal intellectual behavior; half-wittedly, idiotically, retardly. 2. Describing an activity which is lacking in intelligence or common sense. A mildly mentally retarded condition or behavior. 1. 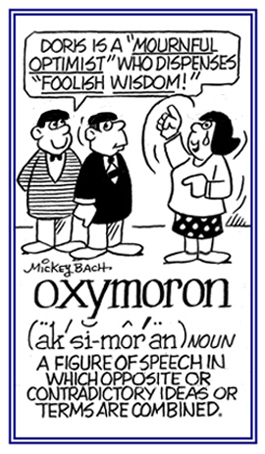 A combination of words or a phrase that have opposite or very different meanings; also used for special effects: The phrases "cruel kindness", "deafening silence", a "mournful optimist", a "wise fool", and "legal murder" are examples of oxymora. 2. A phrase in which a locution creates an incongruent and apparently self-contradictory effect, as in “to make haste slowly”: The two girls decided to make their language special by creating new oxymorons and using old well-known ones, too, as "scalding coolness " from Hemminway and "melancholy merriment" from Byron. 3. Etymology: from Greek, oxys, "keen, point, sharp" and moros, "foolish". © ALL rights are reserved. 1. A second-year student in a U.S. college or a tenth-grade student in a U.S. high school. 2. A person in the second year of carrying out an endeavor. 3. Perhaps by the influence of folk etymology; from Greek sophos, "wise" + moros, "foolish, mentally dull". 1. Exhibiting great immaturity and lack of judgment: Jane's sophomoric behavior was unacceptable. 2. Suggestive of or resembling a traditional intellectually pretentious, overconfident, conceited, and immature person: Hank often asks sophomoric questions in his history class. Inter-related cross references, directly or indirectly, involving the "mind, mental" word units: anima-; anxi-; deliri-; hallucina-; menti-; noo-; nous; phreno-; psych-; thymo-2.